Looking For A Scary Roller Coaster Ride? Here Are 9 Of The Scariest Roller Coasters In The U.S.
Theme park enthusiasts will criss-cross the country just to ride a scary roller coaster. There’s just something about the adrenaline rush (a literal rush!) that compels thrill seekers to jump aboard planes or drive their cars hundreds — even thousands — of miles to spend anywhere from 45 seconds to 2 minutes riding some of the scariest roller coasters. So, where are the scariest roller coasters in the United States? You’ll find them all over. Here’s a list of 9 scary roller coasters (in no particular order) that are sure to turn your stomach inside out. Rising high above the Old Dominion State is Intimidator 305, at King’s Dominion. 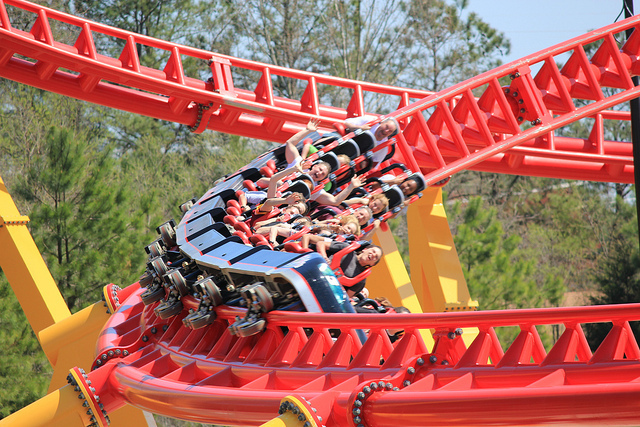 Named for its 305-foot-tall peak, Intimidator 305 thrusts riders down hills and through hairpin turns at speeds topping out at an incredible 85 miles per hour. Hurtling riders along its lumber tracks at 70 miles per hour, El Toro at Six Flags Great Adventure is the second-fastest wooden roller coaster in the world. 70 MPH is fast for any steel roller coaster, but imagine bumping along this wooden track at interstate highway speeds! One of the newest inverted roller coasters in the United States is turning heads and spinning its riders head over heels. Banshee, a 167-foot-tall roller coaster at King’s Island featuring 7 inversions, is a terrifying 4,000 feet long. Think if you’ve ridden one inverted roller coaster, then you’ve ridden them all? Uh uh. Get on this one and then tell me if you’ve ever been on any roller coaster like Banshee! Yes, the “325” in the name of this Carowinds roller coaster refers to the stupendous height of this monstrosity, in feet. Fury 325 tops out at 95 miles per hour along its 6,602-foot-long track, during which riders dive down a 320-foot-tall, 81-degree main drop and hurtle through a maze of turns and twists. This 456-foot-tall Six Flags Great Adventure roller coaster means serious business. Launching from 0 to 128 miles per hour in just 3.5 seconds, Kingda Ka shuttles riders over a 45-story top hat element that rivals the height of most skyscrapers in many cities. You’ll cover the 3,100-foot-long ride in a mere 50 seconds. If you’re a longtime roller coaster enthusiast, you were probably wondering when this scary roller coaster at Cedar Point would turn up on the list. Millennium Force opened in 2000, which is several years before roller coasters regularly approached 300 feet in height. In fact, Millennium Force was the first giga coaster — a type of roller coaster that measures 300 feet tall or higher. Beyond the ride’s impressive height is its unique combination of high speeds and swooping turns. This ride still stands in a class all unto itself. X2 stats alone are scary enough: 175 feet tall, 3,610 feet long, 76 mile-per-hour speeds. Sure. But, guess what? X2, looming large at Six Flags Magic Mountain in California, isn’t your ordinary sit-down roller coaster. It’s a 4-dimension roller coaster — that means the riders’ seats spin on a horizontal axis perpendicular to the track and independent of the vehicle chassis! Top Thrill Dragster at Cedar Point in Ohio may look similar to its cousin, Kingda Ka, in New Jersey, but don’t confuse the 2 roller coasters — they’ve got personalities of their own. Top Thrill Dragster sends riders up a 420-foot-tall tower at the death-defying speed of 120 miles per hour and then hurtles you back to Earth — all in just about 19 seconds. Years after its 2003 debut, this behemoth of a scary roller coaster still ranks across the board as one of the best roller coasters. What do you get when you combine a 415-foot-tall launch roller coaster with superhero theming? A truly epic ride called Superman: Escape from Krypton, that’s what. Accelerating to a speed of 104 miles per hour in 7 seconds, riders feel a G-force of 4.5. You then experience weightlessness for more than 6 seconds as you hurtle up and then down the massive, 40-story-tall vertical element. No birds or planes in sight here. Just a super ride at Six Flags Magic Mountain.